-Random patches of yellowing on the leaves. -External appearance of fruit may be lopsided. -Misshapen or small green fruit. -Fruit would taste salty and bitter. -Fruit could have a curved central core, and aborted seeds. Citrus Greening is the worst disease among citrus trees. 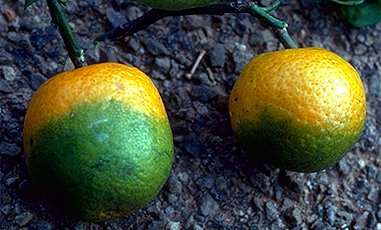 It has killed millions of citrus trees in Brazil, Florida and now being found in California. 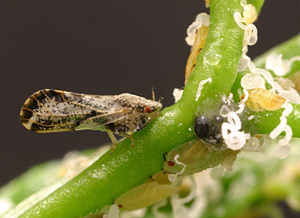 The bacterial disease is carried by the Asian citrus psyllid and attacks the tree's vascular system, producing bitter fruit and eventually killing the tree. Sap-sucking psyllids that feed on an infected tree become carriers of the disease and pass it on to the next tree they visit.